David Bowie a Capricorn? – but he was so Uranian! I was saddened upon hearing of David Bowie’s death in late January of this year two days after having released a new album “Blackstar”’ on his birthday. At that time the public did not know that he was dying from cancer. Upon the news of Bowie’s death, the global outpouring of grief and appreciation for him was a bright spot in a winter otherwise filled with difficulties worldwide. Although I followed had his career distantly I too was caught up in the response to his death. I hadn’t looked at his astrological natal chart until hearing of his death and found myself quite surprised by it. Some of my astrology friends would notice Aquarius rising and automatically assume a strong Uranian influence, augmented by the non-aspect Sun quincunx Uranus in his chart. Instead, I was fascinated by the strong presence of Saturn in his chart: not only is Saturn the traditional ruler of Aquarius but he has Sun, Mars, and Mercury all in Capricorn. Additionally, the Moon’s application is to a conjunction with Saturn. Here’s his chart if you don’t believe me. For such an unusual person with a varied career as a musician and actor he had some qualities of a restless genius but also that of a thoughtful person with an open mind who appreciated not only his public but his responsibility as an artist. Here’s an interview with him from the BBC from 1999. He says, for instance, that putting on roles onstage allowed him to be less uncomfortable; he discusses the effect of his previous alcohol use on those close to him; he treasures the modern idea in art and music (and the internet) of placing the audience or viewer on equal footing with the artist, of celebrating the gap between artist and audience where true creativity lies. He also had some prescient things to say about the Internet. All this helps us better understand his natal chart and him. We could begin with Sun, Mars, and Mercury, all in Capricorn in the Twelfth Place. Sun is important and is also in sect in Bowie’s diurnal chart and also has a sextile from Jupiter that is placed in the tenth. Even from the rather hidden Twelfth House there’s a connection to the Tenth House or Place of career. Sun is also contra-antiscia with Pluto (their midpoint is the Aries/Libra axis) that gives him personal and professional intensity as well as an inner mind that prefers painful clarity to comfortable complacency. Mars is in Capricorn and is the ruler of the Tenth Place, and with the presence of Jupiter in the Tenth, is a good sign of an ability to make one’s way in professional life. What about Mercury? As an esteemed songwriter and visionary and a very articulate man, Mercury seems not prominent a planet here. When we look further, however, we see the square from Neptune and we get the “visionary” part. No, we’re not going to discuss Pisces or Neptune. From a psychological point of view the Twelfth is a place of self-undoing, of unfinished business; from an external point of view it’s the exile and the outsider, remote from the mainstream of action. The Twelfth House is disconnected to the Ascendant, the place of one’s body, outward manifestation, and characteristic ways of encountering the world. Bowie’s two most famous acting parts were the lead in the movie “Man Who Fell to Earth” and that of the Broadway production of “The Elephant Man”. Both works depicted people who could not find their way in an alien and unforgiving world, who had to be the margins of society. We also have his earlier musical performances as Ziggy Stardust. Bowie’s straightforward but sympathetic rendering of all these characters tells us much about him, what he could give to others, and was probably personally redemptive for him. Planets in the Twelfth often have to be coaxed into their full usefulness through clearing up past residue (karma) and from being engaged in a larger purpose, perhaps sacrificing one’s personal happiness to the needs of others. Bowie’s motivations as an artist were the happiness of being creative and a desire to give. A chart with Aquarius rising has Saturn as the ruler of planets in both the Twelfth and First houses and dispositor for any planets in these houses. In Bowie’s chart Saturn is in Leo, in detriment, also in the Seventh House of relationships. (Does that mean that Sun in Capricorn have a mutual reception with Saturn in Leo? I think not, since the signs Capricorn and Leo are signs that are disconnected to one another.) Saturn is in the Seventh: it is through relationships, if at all, that the planets in the Twelfth can best manifest. 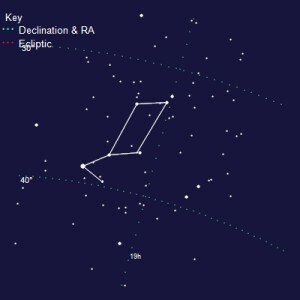 Moon in Leo is also in the Seventh, in the degree opposite to the Ascendant, applying to Saturn. the Moon and Saturn also trine Venus. In the 1999 interview cited above, he cited relationships as the major victim of his previous drug and alcohol abuse, and his will has clearly shown his generosity to many people in his life. Moon and Saturn in Leo are also in trine to Venus in Sagittarius, showing the factors of hard work and discipline as an artist and performer. In my view, Bowie’s Twelfth-Seventh House combination was the key to his enduring influence as a musician, actor, and human being, and why his death caused a strong emotional response worldwide. 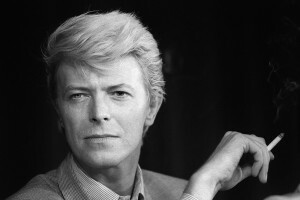 David Bowie was the opposite of the self-absorbed narcissistic popular music star; instead he was thoughtful, reflective, and aware of his impact on others. Thinking also about his interest in audience and viewer participation in music and art, it seems that the “Leo” part of him was never for himself; instead he brought out the Leo in others. He spoke most particularly to those who have been misunderstood, who were cast as outsiders, and who could rise above all kinds of limiting circumstances – and that turns out to be so many of us. 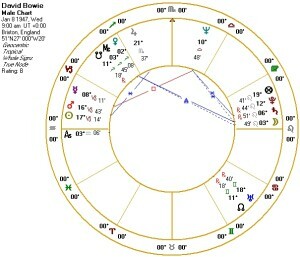 Bowie’s Lot of Spirit is 16° Cancer, the degree opposite his Mars in the Twelfth, governed by his Moon in the Seventh. The Lot of Spirit, symmetrical to the Lot of Fortune across the Ascendant, is an indicator of one’s inner necessities, one’s daimon. 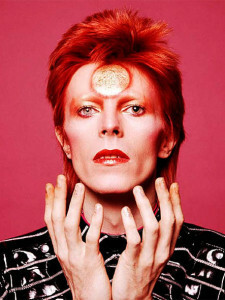 Bowie’s sense of personal expression is connected with the outsider qualities of the Twelfth and the relationship necessities of the Seventh. I close with Bowie’s Venus placement. Using whole sign houses, Venus in not on the “cusp” of the Tenth House but is conjunct the Midheaven degree in the Eleventh. 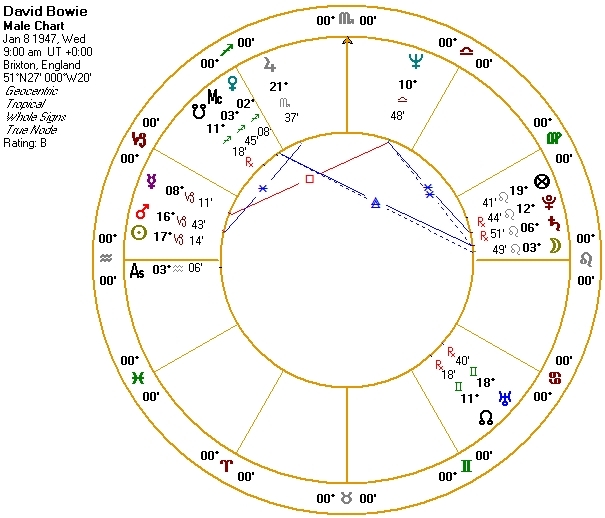 As the intersection of the ecliptic and the meridian, where a planet culminates in its path along the daytime sky, the Midheaven degree helps us understand the intersection between the individual and the larger world; for Bowie the Midheaven degree conjunct Venus emphasizes art, music, performance. This was not just lifestyle but also had a career context, since Venus in Sagittarius is governed by Jupiter in the Tenth. Bowie’s Venus sense of purpose manifested from an early age, from this interest in writing and performing Broadway musicals. Interestingly, he was not a collector of houses or cars or planes – how wealthy people tend of show off their wealth these days – but he used his money obsessively (he says) to collect art. Using the Midheaven degree of calling differently from the Tenth Place of career allows us further subtlety in interpreting David Bowie’s chart. Here Midheaven degree conjunct Venus is disconnected from their ruler: this points to difficulties reconciling one’s calling – the Midheaven degree – with the demands of the public and the so-called “music industry”, the Tenth House. His journey has many public ups and downs and his career was punctuated by changes of residences and periodic withdrawals from public life, yet the conduct of his life showed a strong sense of loyalty to his art and its place in the larger world.